Like the Personal Fiction-Writing Coach FB page and leave a comment to let me and your fellow writers know if the day's tip or writing exercise resonates with you and your project. Grab your writing pals and send them over, too! Find ways not to stop until you get to The End. The list probably isn’t the romantic, idealistic answer you were hoping for, but I wrote this book to share with you helpful, practical writing advice from my twenty years as a working novelist. If you commit to reading the 365 pieces of advice that follow and (here’s the important part) write one manuscript page every day for 365 days, then voila! at the end of one year, you’ll have a full-length fiction manuscript of about 90,000 words. I wrote this book with the idea of dispensing daily inspiration to get you to think about your story—and to write. Because I know from experience your motivation will give out before your imagination will. This book is structured to ease you through the lifecycle of creating a full-length novel, from broad stroke advice and self-evaluating questions, to more specific tips when you get to the planning and writing stages. I’ve also included pitfalls to avoid, lessons I’ve learned and techniques to help you manage your writing time. Can you read ahead? Sure. Skip around? Yes. Ignore one piece of advice in favor of another? Absolutely. Some of the tips will feel organic to you and your project, and some won’t. You might even decide to read the entire book in one sitting—that’s fine. But if you do, please commit to re-reading the book and writing one manuscript page for every section. Because I’d like for you to prove to yourself you can write a novel. Or finish the one you started. Or meet your deadline. Or rediscover the joy in writing. Or reach whatever writing goal you’ve set for yourself. I see you out there, already putting on the brakes, raising your hand, bursting with questions. --Write about anything, as long as it’s not boring. --A manuscript page looks like a page in a book, but with more whitespace. --To get started writing, pick up a pen, or place your hands on a keyboard. --If you’re stuck in your story, then something is wrong with your plot or your characters; figure it out (I’ll help you) and keep going. --You will fail, absolutely, at some point. But hopefully you’ll regroup and try again! But it might save someone’s soul. Or make them laugh. Or prompt them to read into the wee hours of the morning to find out who committed the crime, got the girl, or saved the world. This daily serial will run through December 31. Each day's writing tip or exercise will be posted for 24 hours, 4am Eastern to 4am Eastern. Set a reminder on your calendar, fridge, or phone so you don't miss a single day of advice to get your novel finished! 115. Using curse words @#*%! Like the sensuality level, if a publisher has restrictions on language, their writing guidelines will say so. I don’t give much thought to swear words—if it occurs to me one would be appropriate in the dialogue I’m writing, I write it. Or I might simply have a character think the dirty word, or mouth it. Keep in mind the more often curse words are used, the less their impact. On the other hand, it could be effective if it’s part of a character’s personality to use a swear word as punctuation—just be aware a little goes a long way. Q: Can you think of a good PG-rated curse word? Share your response with other writers on Facebook. 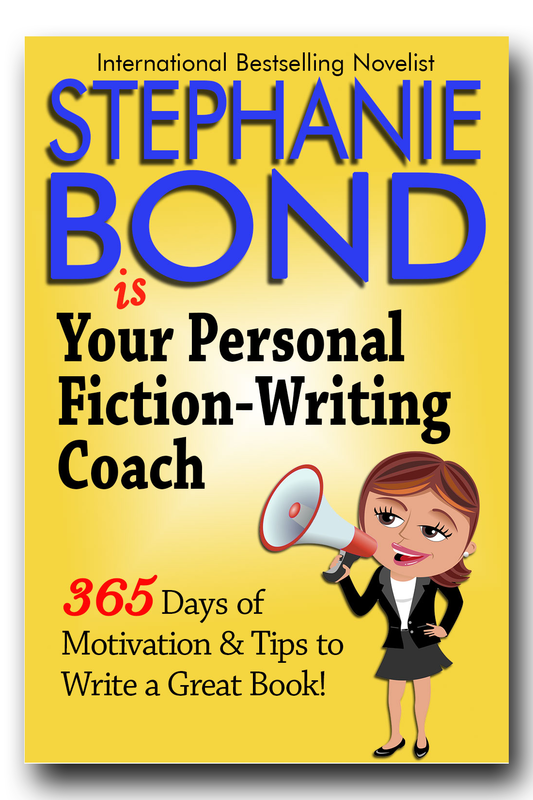 365 Days of Motivation & Tips to Write a Great Book! Can't wait or need to catch up? Order your own copy! Want to go back to www.StephanieBond.com?